Every time there is any kind of a product-related announcement here and elsewhere, there are a number of invariable comments complaining about and/or defending Leica's price strategy. In making these comments, people make references to various economic and noneconomic reasons why Leicas are priced the way they are. This essay is an attempt to show that, basically, almost everybody is right, at least when it comes to Leica's profit motives. Rather than nefarious greed, devious psychological warfare, and, as some often mention, Dr. Kaufmann's ignorance of Leica fandom, Leica prices are basically a function of mathematical inevitability. First, a disclaimer. I am not an economist or an accountant. I have worked in marketing, and I do have a PhD in political science, but, really, I know more about macroeconomics, the economics of whole nations, than microeconomics, the economics of individual corporations. Still, I think I have some handle on the concepts involved, and much of it is intuitive, at least to me, so here we are. Please feel free to post any objections you have, since I'm basically making it up as I go. Also, I am leaving a lot of little details out, and keeping things simple; if there is demand for it (har-har), I will supply further elaborations. Here is a diagram explaining the basics of how to set prices of a product. 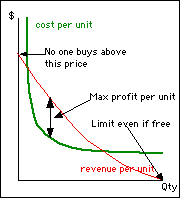 Again, this is a simplified graph that does not truck with the finer points of "marginal cost" and "marginal revenue", which is difficult to understand for most people. It is also an illustration, rather than empirically accurate. If you want to be more accurate, be my guest; you can probably do a better job than I can. First, the green line, the cost curve. This is the familiar "economy of scale" curve. To produce any product, there needs to be an initial investment, which I will call "capital". This acts more-or-less like a "one time expense", and it is fixed through the life cycle of the product. So, at quantity=0, your cost per unit is basically infinite, and at quantity=1, the cost of producing that one M9 is basically the price of the whole factory. Then, the more M9s you produce, the less "capital" you need to recoup in each unit of M9 you need to sell, forming a curve shaped like y = c/x, asymptotically approaching a limit as quantity (x axis) increases. The lower limit is the on-going cost. This includes the cost of labor, parts, maintenance of equipment, sales, marketing, and managerial overhead involved in each M9. Although these, too, decrease with volume, there is sort of a limit to how low it can go. (There is also a limit on quantity, known as "production capacity", which I will discuss later.) This is why as quantity goes to infinity, cost does not reach 0, but hits a sort of a price "floor", the minimum possible cost of producing and selling an M9, even after you've recouped your initial capital investment. Second, the red line, the revenue curve. This is a function of how many M9s one could sell at a given price and is a measure of consumer sentiment toward the product. One thing to note here. 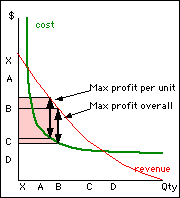 With revenue, the price per unit determines the quantity sold, whereas, with cost, the quantity produced determines the cost per unit. This makes these graphs a bit confusing, since the x-axis is the causal variable for cost, whereas the y-axis is the causal variable for revenue. Anyway, the revenue curve starts at a point where the price is so high that literally no one would buy it, and goes to the point where, even if you give away M9s for free, there is a natural limit to how many people would take it. Wait, you may be saying, why would anyone not want an M9? Actually, I might not take an M9 even if it is free; I don't like (gasp!) rangefinders. My eyes can't handle them. Also, M lenses are too expensive for me, and I have a stable of telephoto R lenses, too long for a rangefinder. An M9 won't do me any good, since R lenses are not rangefinder-coupled anyway. I can't even sell it and buy a Nikon D800E and some Leitax adapters, because, being free, no one would pay for my M9. So, no go. My partner would not take the M9, either; she rarely takes photographs, and she would laugh at the price of the lenses, even the Voigtländers. I'm the girl with the camera in this family, and I don't want it, although I see the point, and she doesn't even see the point. You get the point. So, you can see that, in most cases, the revenue line and the cost lines intersect at two points. (The exceptions would be if the revenue line falls below the cost line; then you're screwed, and can't make any profit off your M9, at any price.) In between these two points, we have a viable business that is profitable. Somewhere in the middle is kind of a "sweet spot", where the revenue line is far above the cost line. This is the "profit maximization" point where every company strives to be. Figure 2. Maximum profit per unit vs. maximum profit overall. If the price/quantity is set to "B", you are making as much money off your operation as you possibly can. But, is that really where you want to be? Sometimes, market share is more important than profit; having a large market share of full-frame cameras, for instance, allows you to sell more full-frame lenses. You may also need more revenue, even at lower profit, to have more cash on hand to do other short-term things. You would then set your price/quantity to something like "C". Or, you can sell M9s at a loss by setting your price/quantity at "D". A lot of people will buy M9s, and then plunk down more money for the lenses and viewfinders and motors and those fantastic-looking cases that advertise to every purse-snatcher that the camera you are holding with a piece of electrical tape over the red logo is, indeed, a Leica. Give away the camera, sell other stuff. This is the strategy followed by most inkjet printer manufacturers and cell phone services. So, then, what happens if the prestige of a product goes up? Let us assume, for the rest of this exercise, that Dr. Kaufmann is basically interested in maximizing the profit on the M9. I want that, in fact, because more profit from M9 means more capital for the full-frame mirrorless with EVF and contrast detect that I keep asking for. Or maybe the R10 or a new DMR. Right. The M9 and the M9-P are basically the same thing, and the actual cost of producing them, at the same quantity, are probably close to identical. Edmund Optics sells optical-grade 2.5-inch all-band sapphire windows for $354 each; my guess is that the M9 window costs about $100 at quantity, which will be mostly canceled out by the savings from the absence of the red dot, right? Regardless, I am going to assume, for convenience, that they cost exactly the same at the same quantity. Then, I'm throwing in here an imaginary Panasonic-branded M9, made in the same factory and everything, so same cost at the same quantity. 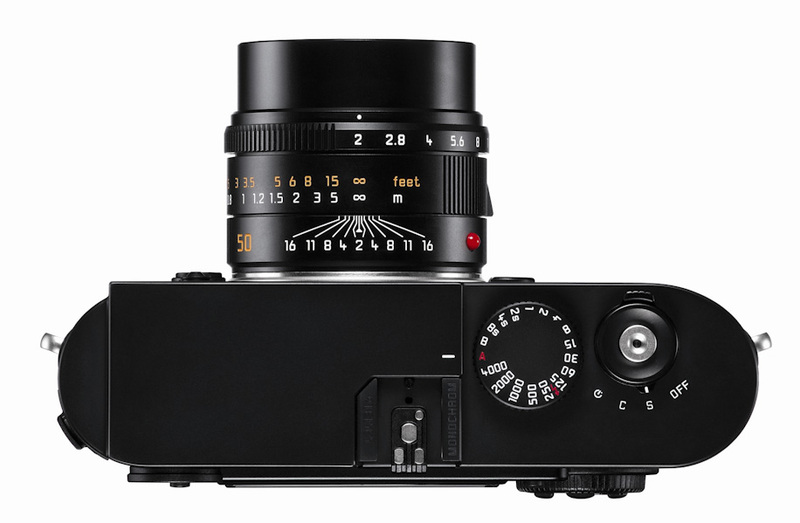 Whether we like it or not, the Leica brand does mean something. There is a reputation for quality and value, established over more than a century, that is undeniably well-deserved, despite the many mistakes they have made. Panasonic, by contrast, says "cheap mass market", no matter the actual quality of the product. That means that people are going to buy more Leicas than Panasonics at the same price. Wouldn't you by the D-Lux 5 rather than the DMC-LX5 if they were the same price? Or, even, the Leica PA-Curtagon 4/35 rather than the Schneider PA-Curtagon 4/35? Crazy, but true. Same with the M9-P. There is something magical about that logolessness and the sapphire window, although they add little to the image-capturing ability of the cameras that a piece of electrical tape over the logo cannot achieve. Yes, image-capturing is what we buy these for, right? Right? Oh. That's why I don't want an M9... because I can't capture anything with it that is in focus. Oh, well. Now, note that the "price at which no one will buy" is also higher for the more "prestigious" models, but, as the price drops, the difference between the models kinda' disappear. In the end, someone who does not want an M9 would not want it no matter what its name is. Rose is a rose by any other name, and I'm just as allergic to the smell. And, now, finally, look what happens to the "sweet spot"! 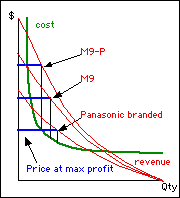 M9-P's price needs to be set higher, and the quantity lower, because of its "prestige" curve, even though more people would buy it at the same price. Panasonic, by contrast, must sell at a lower price, but that will get them higher quantity. No nefarious desire to control people's mind is required here. Nothing about the constraints of the economy of scale. M9-P is more expensive because more people would want it at the same price, not because fewer people would dare buy it. Ironically, in cases of prestige, higher demand leads to lower quantity. What one really needs, then, is great marketing research, to see where people's minds are at, and great marketing, so people will perceive your product as more desirable, more prestigious, thus moving the revenue curve. This is the hard part. Sigma's SD-1 is, no doubt, a fantastic product, with stellar image quality for an APS-C sensor. However, Sigma also has a reputation for "cheap", and the SD-1 apparently also has clunky software that helps mar its reputation, without 100 years of history, like Leica's, to earn any forbearance. In other words, Sigma was hoping that the image quality of the SD-1 would speak for itself, and make it a "prestige" product. Unfortunately, as they quickly realized, it was treated as a mass-market product, just as a Panasonic-branded M9 would be. Same thing basically happened with the Zeiss Ikon, which was every bit as good as the M6, but the fact that it was made by Cosina, not Zeiss, meant that its price had to be significantly lower. Even Zeiss has a slightly lower "reputation price" than Leica, although arguably they are just as capable as Leica in many ways. Oh, then, what about the M9-M, the monochrome version of the M9? One can assume that some people would really want it. These are the people who really need it because of the kind of work they do, or people who want it because it seems really cool and, besides, it looks great when Seal is holding it. Still, people who are at the "mass" end of the curve, those who would buy a Leica only if it is dirt cheap, would be a lot less likely to want it. To them, the black-and-white sensor is not a great feature, but rather a lack of feature. I am assuming here that the M9-M is, at the same quantity, cheaper to produce than the M9. Normally, this would make it so the sweet spot is at a lower-price/higher-quantity combination. However, the steeper and higher curve of the M9-M demand makes it so that the price needs to be higher to maximize profit. To the left of and above the intersection between the revenue curves of the two models, denoted by "A", we have a few people who really want it. 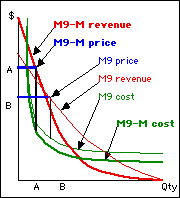 To the right of and below the intersection, denoted by "B", most people would prefer to have the M9, and you'd practically have to give the M9-M away to increase the sales quantity much. So, having fewer, more fanatic customers leads to lower quantity and higher price, even at lower cost. Figure 6. The effect of expansion. Still, even with the slight increase in cost, the greater production capacity allows you to lower the price even further than you could have before the expansion. If you cannot, in fact, increase your profit by adding a factory, you would have to have a reason other than the profit motive to do it. This gets a little complicated, since the goal is to maximize the profit of the whole company, not of a single product, but, if they've done their homework, Leica should be able to lower the price once their production capacity increases, even for their "prestige" products. 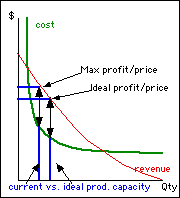 If profit is the motive, it is not in their interest to keep the prices higher than the profit-maximization price, or quantity lower than the quantity-maximization quantity. You may have noticed that I do not address the question of "Is Dr. Kaufmann inflating the price, in order to create prestige?" I will touch on this here briefly, using the models I have laid out so far, but with a less quantitative, more speculative spirit. On the surface, the argument makes sense, and I'm sure many companies do that, but I doubt that this is the case with Leica. If Dr. Kaufmann is raising the price to create prestige, then he is running a very expensive marketing campaign. 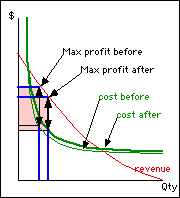 Remember, excessively high price results in higher per-unit profit, but lower overall profit. Think about all the profit he loses by raising the price. Wouldn't it have been better to collect all that and hire a stable of well-respected professional photographers to take some fantastic images and post them on their Web site? Wait, they are already doing that! (Man, have you seen those S2 raw image samples?) In fact, given Leica's history and reputation, most people would be happy to do it for the price of a single M9 and a single Summilux, or for as little as the pleasure of using an S2 for a month or two. Heck, I'd do it! Wouldn't you? Why raise the price and lose the sale of dozens of M9s, when you know it would also piss a lot of people off, and when you can increase the prestige for the price of one or two? When renovating a small section of a reputable store in a rich neighborhood will do? When many such stores would be willing to pay to do it themselves? It seems unlikely that Dr. Kaufmann would sacrifice significant amount of profit for a very ineffective, risky campaign, when other, very cost-effective campaigns are available. It may also be more effective to sell at maximum profit, and use the profit to develop new products and features that will further add to the prestige of the brand. They have done that with all those "special edition" cameras, believe it or not; I said "new", not "innovative". Hopefully they have done that with the M9-M, and will do it with the mirrorless "solution" this fall. I hope this makes some sense and enlightens our discussions, which, as I have said elsewhere, I enjoy immensely, even when things turn less civilized. Thank you for your indulgence. Again, please feel free to comment and/or offer alternative models.